First, I love this information sheet from the Fred Rogers Center titled “Advice for Parents of Young Children in the Digital Age” and wish every parent read it. We KNOW parents are letting their one year olds watch TV and play with their iPads. They will expose their kids to screens. Why not give them tips for using their media tools appropriately with their children? We do this with books already. We are not likely to suggest Weslandia to a mom of a 12 month old, but instead steer her towards some of our favorite board books, maybe some lift the flaps, or Karen Katz. We wouldn’t tell her Weslandia is bad for her child, just that it’s not written with her child in mind. Why should apps and dvd’s be any different? They are are going to check them out, why shouldn’t we at least steer them towards the ones which are the most appropriate for their child? Storytime gives us an excellent opportunity to do this! We have a captive audience who expects us to give them early literacy tips already. So there you have it. As an “educator” in this context, I’m certainly limiting their screen time use-the book is only 3 minutes for goodness sake-but am also acknowledging that co-viewing a Tumblebook may strengthen a parent’s relationship with their child as well as their relationship with me. Just like a regular old print book would. Plus, this way, when there are 70 people crammed in one room they can all see the pictures a lot better than with the smaller version of the book. Knowing me, I did NOT say it so eloquently, but that’s what I had “rehearsed” to say. And was met with about 30 head nods and looks of “oh, huh, ok”. The first storytime I just let the book run on auto. It was WAY faster than I liked so for the second storytime I put it on manual so we could really take our time stretching and doing the motions along with the dog. Let me tell you, I have NEVER seen these grown ups get so in to a book. Maybe it was the dark, maybe it was my speech, I don’t know, but the kids and grown ups were having a great time. 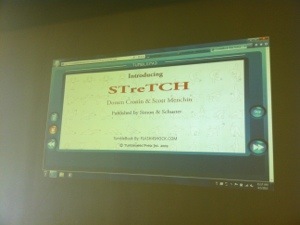 The book was Stretch by Doreen Cronin. Here’s the screen I had up on pause while we did our opening rhymes. Reach for that apple! Yum! After the book was over I invited parents to ask me about Tumblebooks after storytime (added bonus is getting the word out about a database!) and moved on to our next activity, which was Head Shoulders Knees and Toes. 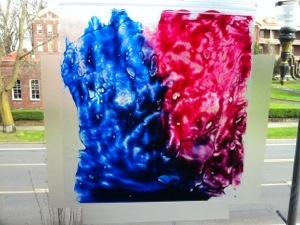 Aside from the digital book, storytime went on as usual, ending with this fabulous, no mess, finger painting activity. 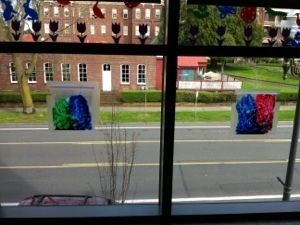 Finger paint in a ziploc baggy stuck to the windows. They squished, wrote, and talked to their parents for a very long time with those bags. 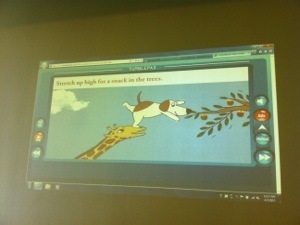 Awesome use of technology in storytime! I’ll definitely be looking into this some more. Thanks for all the great advice! Great use of Tumblebooks! And I love that craft, I may be borrowing that idea soon. During summer reading, we do all our storytimes on the big screen (PowerPoint slides). To me, storytime isn’t storytime without flannels, so last summer, I used the PowerPoint to recreate flannels for a large audience. That cheesy animation actually can be used to great advantage in storytime. Hope this makes some kind of sense, feel fee to tweet me if I can explain further! Do you just scan the books and put them into power point? Glad to hear about the power point! That’s the direction I was leaning but wondered about how it would look. Thanks! P.S. I am finally trying out the song cube on my baby rhyme time next week, hooray!